Early in the season, Nick Castellanos, the Tigers' rookie third baseman, was answering the questions presented about him being thrust into the starting lineup at the tender age of 22 on a club favored to win the World Series. His statistics weren't overwhelming, but he was hitting the ball consistently hard. He hit a few home runs. He had been moved to back to third base after year in the outfield in 2013 at Triple-A Toledo (he played shortstop as an elite-level age group amateur), and was making the routine play. 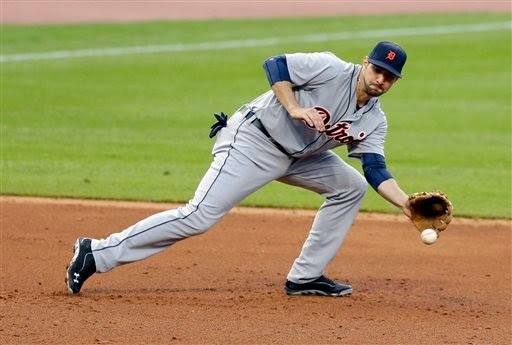 The Tigers were winning, and Castellanos was contributing enough to justify his spot in the lineup. But what had been growing pains has become alarming. The numbers don't lie. He has fallen off dramatically at the plate. He hit four home runs early, but hasn't hit one in his last 88 at bats.. Only weak-hitting shortstop Andrew Romine has a lower slugging percentage among Tigers' regulars than Castellanos at .355. His on-base percentage is .282. His OPS is .637. All figures are well below the MLB average. Range defensively has become an issue. Tigers closer Joe Nathan was criticized recently for pointing out how much Castellanos not making a makeable play last week at Oakland hurt his performance and that of the Tigers. While not tactful, he was correct. Castellanos only has four errors, but his defensive range metrics recently have nose-dived. He is not a plus baserunner. What it adds up to is a Sabermetrics statistics WAR of -0.7. (Castellanos isn't the only Tiger struggling defensively statistically, Torii Hunter's defensive metrics are even worse, and his WAR, subsequently is -0.5, but he has hit eight home runs and has an OPS above the MLB average and is, well, Torii Hunter). But to give you an idea of how badly Castellanos is grading out Sabermetrically, he is tied for 1,003rd among 1,028 MLB players in 2014 in WAR (the baseball-reference version). Count me among those who still sees a bright future for Castellanos, but I did think he would be a bonafide Rookie of the Year candidate this season and he hasn't even come close so far. To this stage, he's done more damage than good for the Tigers, which they were able to mask earlier and it appears he may not be ready for the Major Leagues at this stage. The problem is the alternative. How about a left-side of the infield consisting of Don Kelly and Andrew Romine? Still worried about that draft pick the Tigers would have lost by signing Stephen Drew? I think Nick will be better but why not start to covert their extra middle infielder in the system, like Perez,to 3B. They should also take a look at Mike H at some starts at 3B. Few years ago he was rated as average 3B defensively.